Gee, I'd better print out the shopping list ASAP for inspiration! Yeah, it would be nice if it came all filled in. you are a plethora of fabulous ideas! As always, thank you! Thanks, I'm so printing gift list! 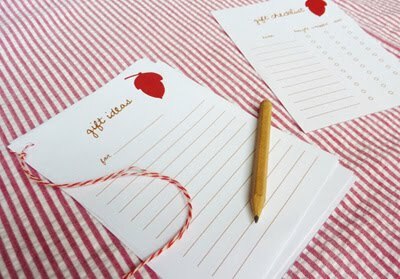 I need to be inspired to list thoughtful gifts! Very nice. I love how you compile all these great links for us. card design and Alicia for the wonderful gift ideas list and checklist. This will make gift giving and shopping much easier! You find the absolute best stuff. Thank you! I love the card, thanks for the link. It's time to start thinking about that, huh? Great ideas about how to extend personalization! Add a photo on your list to make it stand out even more - then begin your shopping! What great Christmas cards and gift list. Thanks for the post!